David Bomford and his wife Sarah (Burtchaell) (8.11) died in 1809 (19.6.1, 19.6.2) leaving one son, Isaac an attorney of Dublin, and four daughters, Jane, Anne, Mary Elizabeth who died young, and Sarah Frances (19.7). Isaac married Jane Holdcroft of Kells in 1807 (19.5) but they had no children and so, when he died in 1837 (23.4), his property passed to his nephew, Isaac North, youngest son (23.7) of his sister Anne who had married John Roger North of Whitewell (16.3). In the terms of Isaac Bomford’s will (23.4.1) Isaac North had to take the name of Bomford which he did, and this was the start of the lineage of the North-Bomford family of Ferrans (Chapter 27). See the North family tree. However before we reach that time we must first pick up the threads left from Chapter 19. Isaac was living at No 9 Belvedere Place from at least 1815 to 1823, and according to Watson’s Almanack he moved out in 1824. From 1824 until he died there in 1837 Isaac was living at 43 Blessington Street. Actually the Almanack shows John Bomford living at No 43 Blessington Street at this time but deeds of 1828 and 1829 place Isaac in Blessington Street and so John must be a misprint for Isaac; in any case there is no living ‘John Bomford’ at this time. Isaac’s widow Jane lived on in Blessington Street until she died in 1840 when the house must have been sold. Isaac may have had a second town house, 17 Dominick Street, which according to the 1836 Almanack belonged to ‘Mr Isaac Bomford’. This second house became the town house of the North-Bomfords and remained so until 1860, but more of that later. John R North who witnessed the deed is probably John Roger North, the eldest son of Isaac's sister Anne Bomford and John North (16.3), who was also an attorney in Dublin and married Ellen or Eleanor Barbour (23.7). The deed was signed by Isaac Bomford and witnessed by Duke Cooper ‘Gentleman of the City of Dublin’ (16.2.1). On the death of David Bomford in 1809 (19.6.1) his son Isaac (1766 - 1837) became the owner of all the land in Gallow, Ferrans and Tyrrellstown. However in his will (19.6) David indicated that his half of Ferrans should go to his grandson Isaac Cooper (or if he should die to his brother Duke Cooper) (sons of David's daughter Jane, 16.2.1) and that his half of Tyrrellstown should go to his grandson David North (or if he should die to David North's brother Isaac North) (sons of David's daughter Anne, 16.3.1); the trustees for David Bomford’s 1807 will were his son Isaac Bomford and Antony Cooper. Antony Cooper can not be placed as a relation of the Coopers, but little is known about the Cooper family; since Antony was a trustee of the 1807 will it is thought that he must be of the same generation as Jane Bomford who married Duke Cooper in 1785 (16.2), and perhaps her brother-in-law. In the deed of 1819 it would appear that Isaac Bomford is handing over the land to the second of the trustees of David’s will, Antony Cooper; and that in the later deed John Cooper, the elder brother of Isaac and Duke Cooper (all sons of Jane Bomford and Duke Cooper, 16.2.1), queried the entail and had the matter clarified so that, with the entail removed, his younger brother could inherit without difficulty. The removal of the entail seems to have backfired on the Cooper family since Isaac Bomford was no longer tied to his father’s wishes and was able to leave the land to whomever he chose, and he chose the North family. Since we know so little of the Cooper family it is difficult to know why this happened. Isaac’s eldest sister Jane married Duke Cooper of Great Down in 1785 (16.2). Jane was still alive in 1835 but it looks as though her husband Duke had died before 1820 because it was his eldest son who raised the question of the entail in February 1820. They had three sons, John the eldest who may have inherited Great Down if it was not already sold, Isaac and Duke. They all lived in Dublin and must have had some employment there, most likely to do with the law. As the children of Isaac Bomford’s eldest sister they would have inherited in normal circumstances but Isaac chose otherwise; we simply do not know the reason. However we do know that young Isaac North, youngest son of Jane's younger sister Anne, was probably farming part of Ferrans at this date or a little later, certainly he was there in 1836 by which date he (or Isaac Bomford, 19.6) had built himself a house, Ferrans House (23.3.2), and had married and had at least three children. It is doubtful if Isaac North would have built a house if he had not known that Isaac Bomford was going to leave the land to him when he died. We do know rather more about the family of John North and Anne Bomford (23.7): the eldest son John Roger North was an attorney and inherited Whitewell; the second son David North was in the Royal Navy at this date and ended as a Captain, he eventually settled at Far View near Rochfort Bridge in Westmeath; the third and youngest son Isaac North was the farmer mentioned above. Thus it does look as though Isaac North was the most suitable one to inherit Isaac Bomford’s lands. The history of Gallow, Ferrans and Tyrrellstown (11.4.1) following the death of the Rev John Bomford in 1776 (11.11) has been left pretty much as originally interpreted by Peter Bamford. It may, however, have been rather more complex. Gallow, Ferrans and Tyrrellstown were divided between brothers Isaac Bomford the elder and David Bomford on the death of their brother the Rev John Bomford (11.11). Isaac Bomford the elder left his halves of all three properties to Isaac Bomford the younger (16.6). In his will of 1807, David left his half of Gallow to Isaac the younger too (19.6) so Isaac the younger ended up with all of Gallow. Under Isaac (the younger)'s will of 1835 (23.4.1) the whole of Gallow and Isaac's half of Ferrans then passed to Isaac North-Bomford. In his will of 1807 David Bomford left his half of Ferrans to his grandson Isaac Cooper the younger (19.6) and that might have been the last we heard of that part of Ferrans; however, the whole of it was in North-Bomford hands in 1863 (28.1.2), so perhaps there was a negotiated return of David Bomford's half of Ferrans from the Cooper family to the Bomfords, so that all of Ferrans ended up in the hands of Isaac Bomford the younger and then Isaac North-Bomford. If that were the case, it would be for the Coopers to give up any entails in their favour, and it is not clear that Isaac could have removed entails unless they were in his favour: it may be worth having a second look at the deed of 1st February 1820 (23.1.3). David Bomford left his half of Tyrrellstown to his grandson, David North (19.6). In his will of 1835, Isaac the younger left his half of Tyrrellstown to David North as well (23.4.1), so David North ended up with all of Tyrrellstown. Tyrrellstown passed to David North's son Isaac Bomford North (23.7.2) (who migrated to Australia (23.7.3)) even though it was not mentioned in David North's will (23.7.1). Isaac Bomford North passed Tyrrellstown to his son, another Isaac Bomford North, and that is the last we hear of it (23.7.2). The acreages of some of the properties change in the deeds. Tyrrellstown started as 347 acres (11.4.1) and was still 347 acres in 1887 (23.7.2). Gallow started as 421 acres (11.4.1) and had expanded to 846 acres by 1836, of which 596 acres were in Bomford hands (23.3), though the original 421 acres could still be identified in 1863 (28.1.2). Ferrans was 429 acres (11.4.1) and was still 429 acres in 1863 (28.1.2). After his father David died in 1809 it would seem that Isaac Bomford leased Gallow to Patrick Maher. This deed indicates that Patrick had recently died and his son (?) William continued the lease; in turn; William’s son, another Patrick, continued leasing Gallow until after 1854 (27.3); indeed Mahers remained there until the 1920s. Incidentally although a number of Bomfords were buried in the Gallow graveyard, there appear to be no Bomford headstones. There are no deeds about this marriage, but it is well documented in Burke, which dates the marriage on 8th October 1830. The ‘Grand Juries of Westmeath’ states the marriage took place in 1829 and that Belinda died in 1854 which Burke places as 1852; I see no reason to doubt the more precise dates in Burke, particularly as the ‘Grand Juries of Westmeath’ has been proved inaccurate in a number of instances. After their marriage they lived at Ferrans House, at least they were living there in 1836 according to the Ordnance Survey (27.1). 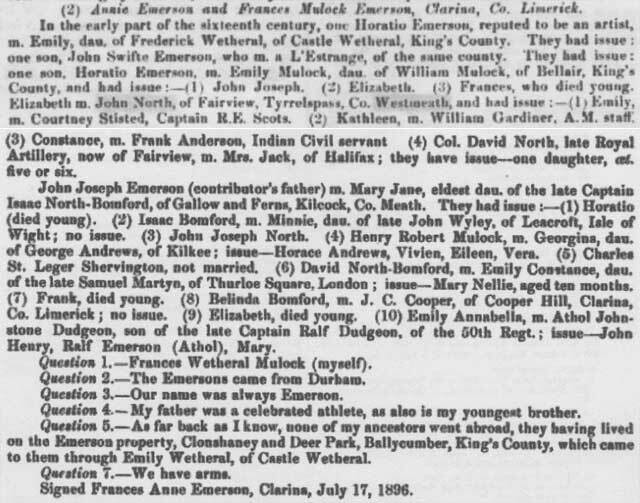 The Pilkington family is recorded in Burke, but the Grand Juries of Westmeath (1853 by John Charles Lyons) has interesting additions including the Emerson family, which have not been found elsewhere. The family of Pilkington is of Saxon origin. At the Battle of Hastings the chief of the family fought on the side of Harold, and on his defeat he disguised himself as a mower to escape from his Norman pursuers. For this event Leonard, who, joined the First Crusade, had a mower in his crest. In the 1600s the family were staunch Royalists and lost much of their property in Lancashire under the Commonwealth. Richard Pilkington had to agree to adjust his estates and accepted extensive property in Co Westmeath and King’s County before 1695, and settled at Tore, Co Westmeath. The name Tore, also spelt Toar, has been changed in recent times to Torr and it lies to the southeast of Tyrrellspass. Richard was born in 1635 and died in 1711 leaving two sons and eight daughters; the elder son died and so the younger son, Abraham, succeeded. Abraham Pilkington died the year after his father in 1712 leaving one son and four daughters. His only son Henry Pilkington of Tore married twice, and died in 1777 leaving three sons; the eldest, Abraham, succeeded to Tore. Abraham Pilkington in 1748 married Mary Shaw of Raheen, Queen’s County, and died in 1799. He had three sons and three daughters. Two of the daughters married into the North family; Sarah married Philip North, and Anne married Charles North; these two Norths were sons of Roger North of Newcastle (16.4.2; North tree). The eldest son, Henry, inherited. 1. Frances Margaret Pilkington, b 1779 (Raymond Krepp email 21 Oct 2008) buried 1801, St Peters (to be confirmed: Richard Emerson email 4 Jun 2008), married December 1797 John Swift Emerson (Betham's marriage licences 7 December 1797, St Peters; memorial of deed 506-455-333013 in the Registry of Deeds, of 8 & 9 December 1797 between John Swift Emerson, City of Dublin, gent, of the first part; Margaret Johnston, otherwise Wetherell of City of Dublin widow and Frances Margaret Pilkington, city of Dublin , spinster, grand niece of the said Margaret Johnston of the second part; and the Rev John Mulock of Bellair, Kings Co, Elia & John Swift of Medwill, Co Westmeath of the 3rd part. Reciting marriage agreed upon and intended to be solemnized between John Swift Emerson and Frances Margaret Pilkington ... (Richard Emerson email 4 Jun 2008)) and had one son (and perhaps a daughter, Mary Emerson, though she may be a daughter of John Swift Emerson by a second marriage after Frances Pilkington died in 1801). Margaret Wetherall m John Johnson in 1772 (Appendix to the 30th report of the Deputy Keeper: Richard Emerson emails 7 and 8 Jun 2008). John Swift Emerson died in 1836, leaving a will (see below). The Dublin Almanac and General Register of Ireland, Pettigrew & Oulton, 1836, p 286, has John Swift Emerson at Anna Cottage, Monkstown (Richard Emerson email 4 Dec 2014). John Thomas Papworth exhibited Perspective view of two Cottages erected for J.S. Emerson, Esq at the Royal Hibernian Academy in 1835 (RHA 1835 no. 233). This will implies that John Swift Emerson's mother was a Swift, and she had a brother John Swift, John Swift Emerson's uncle, presumably the John Swift ('Elia & John Swift of Medwill, Co Westmeath') mentioned in John Swift Emerson's marriage settlement (above). So she was not Mary Emerson/Smith/Osbery, and Miss Swift's marriage to Joshua Emerson was probably an earlier one. We do not know her given name. If his mother died before 1765, when his father married, and his father died in 1774, John Swift Emerson may have been raised by his uncle John Swift, and Elia of the marriage settlement may be John's wife: there is no mention of Mary Emerson in the marriage settlement. If his father's marriage in 1765 was a remarriage, then John Swift Emerson was born before then, perhaps in the early 1760s. Then he would have been in his thirties when he married in 1797, and in his 70s when he died in the late 1830s (below). Richard Emerson (email 17 Jul 2015) has found, but not further investigated: Registry of Deeds, Dublin, 484 Ogden Robert, Annsbarang, Co Wexford, gent 18 May 1786, Memorial witnessed by Hercules Atkins, city of Dublin, attorney, John Emerson, Dublin, apprentice to said Hercules Atkins. That is consistent with John Swift Emerson b c1760s. John Swift Emerson was commercially involved with a number of Swifts, some of whom may be his cousins. Registry of Deeds Memorial 496-487-327553 has been transcribed as follows: 'William Swift and John Swift Emerson both of the City of Dublin, Park Street indented deed dated 12 June 1795. William Swift and John Swift Emerson both of the city of Dublin, of the one part, Thomas Leech of the second, [name missing?] city gent of the other part. Whereby after reciting a deed of lease of the premises hereinafter mentioned dated March 1st 178[?] between Rev Beatter King of second, [another name missing? ], City Portrait painter of the other part and other assignments to the 2nd June. John Swift Emerson for the .... therein mentioned did....unto Thomas Leech and all that house or tenement lately built by Thomas Price site on called by name Park Street leading from Dublin to Baggotsrath with the brickside stable, chaise house. Witnessed by Elizabeth Swift and Dean Swift, John Swift Emerson, Jane Swift in the presence of Deane Swift and Elizabeth Swift'. Also, John Swift Emerson was in partnership with Benjamin Swift, at 25 William Street in 1815 and in 1820 at Hollies Street (Richard Emerson email 7 Jun 2008). John Swift Emerson was a solicitor, in partnership with a L'Estrange: the office of 'Emerson and L'Estrange' was at 49 William Street, Dublin, in 1832-3. This L'Estrange could be the R A L'Estrange who witnessed a 1836 codicil to John Swift Emerson's will (below). Richard Emerson (email 24 Oct 2008) suggests R A L'Estrange is Robert Augustus L'Estrange, attorney of Dublin, grandson of Samuel L'Estrange and Anne Bomford (15.1.1 - 5c). In his will dated 1833, Francis L'Estrange, surgeon of Dublin, left his lease of the ‘Lands of Glascorn’ to his son Robert Augustus L’Estrange, solicitor of Dublin. Glascorn House on the map is a mile east of Rathconrath on the Mullingar to Ballymahon road. In the Dublin Directory for 1842, he appears as Robert A L'Estrange, Solicitor, 9 Harcourt Terrace, Dublin, while a Francis L'Estrange, dentist, is at 39 Dawson Street, possibly his father's house, see below, and therefore a possible brother of R A L'Estrange. In 1850 Robert L'Estrange and Edgar L'Estrange were living at 9 Harcourt Terrace. The father, Francis L'Estrange, surgeon, was living at Dawson Street, Dublin in 1834 (London Medical and Surgical Journal, published by G Henderson 1835 Page 123, Google Books). He appears in the medical journals as late as 1836. Harriet L'Estrange, wife of William MacLoughlin, who gave birth to a son William at Glascorn, Co Westmeath in 1817, may be a sister of R A L'Estrange. Bomford - L'Estrange connections are outlined at 8.5.2. John Swift Emerson was a member of the Corps of Attornies in Dublin. He is remembered for his part in the arrest of Thomas Russell on 9 Sep 1803, in the aftermath of the 1798 rebellion in Ireland, and a subsequent dispute about his entitlement to a share in the reward of £1,500 offered for Russell's arrest. Russell was subsequently convicted of high treason and executed. See United Irishmen, Their lives and times, RR Madden, 1846, Third series, Vol II, chapter VIII, pp 226-236 (Google Books), and ibid, 1842, [Series 1] Vol 2, pp 63-64 (Google Books); and The History of Irish Periodical Literature, RR Madden, 1867, Vol II, p 82 (Google Books). According to The History of the Orange Order, William Banks, 1898, Major Sirr and J S Emerson were both Orangemen (Richard Emerson email 28 Nov 2009). An Encyclopedia of Dublin by Douglas Bennet, 1991, p 88, records that in 1836 a further lease of ninety nine years on a house and garden known as The Artichoke was given to John Swift Emerson who built houses on the site and named them Wentworth Terrace after Thomas Wentworth Earl of Stafford. The Artichoke was a house in Grand Canal Street built in 1736 by John Villiboise who cultivated artichokes in the garden. The house was called The Artichoke by local inhabitants (Richard Emerson email 28 Nov 2009). a. Horatio Emerson or Horace Emerson, b c 1798, died before January 1833 (his father's will), entered Trinity College Dublin July 1814 aged 16, son of John Swift Emerson, solicitor, graduated BA 1818 (Richard Emerson email 7 Nov 2008), married 1825 Emily Mulock, daughter of John Mulock of Bellair (so granddaughter of the Rev John Mulock and Emily Frances Wetherall: 15.1.2), and had three children. According to Eileen Emerson/Russell (27.4.4) in her schoolgirl copy of a Minchin manuscript family history, Horatio lived at Deerpark and was in the process of building a house worthy of his successors but was shot dead by one of his tenants. There is a will, not seen, dated 1826, listed in the Index to Prerogative grants at the Public Records Office (Richard Emerson emails 2 & 3 June 2008). c. Anne Emerson. The Westmeath Journal of 22 Oct 1829 reported the death at Monkstown on 13 Oct 1829 of Miss Anne Emerson, daughter of J S Emerson Esq (Richard Emerson email 4 Dec 2014). 4. William Lowe Pilkington, Lieutenant Royal Navy, died 1809. To put the above into a tree and by following the Mulocks (15.1.2) it is possible to tie in both Edward Bomford of Hightown and Stephen of Gallow. The tree also shows many of the Bomford cousins. Note: there have been some changes to the accepted relationships in the Mulock and Pilkington families since the above tree was drawn. See text above and at 15.1.2. The Field Name Books of 1836 give updated information of Isaac’s properties in statute acres, and the following is an extract. ‘Mr Bomford’ is Isaac. Kilglan, next door to Ferrans, used to be a Bomford property, but it is not listed as such in the 1836 Field Name Book. It is possible that the 65 acres is now part of Ferrans, but it must be deleted from our list of properties. Tyrrellstown, 347 acres, remains one of Isaac’s properties but in the Westmeath Name Books appears to be missing. No doubt he has it all let at, say, £1 an acre. These 1,355 acres would give Isaac an income of between £1,800 and £2,400, depending on the letting value of Gallow, less such payments as tithes, tax, cess and so on. The valuation figures in 1854 were for tax purposes and so were no doubt kept as low as possible. However both these houses must have been fairly small to be valued at such low figures; for comparison both Rahinstown and Oakley Park were valued at the same time at £50, more than three time the figures for Gallow and Ferrans. Gallow House used to be the major Bomford house. Stephen the elder first lived there in 1711 or 1712 (2.5) when he moved from Clonmaghan, and he died there in 1759. Then the Reverend John Bomford lived there (8.7) until he died in 1776. There was then a gap of about ten years until David moved there from Dublin (8.11), and he stayed there until he died in 1809 (19.6). No Bomfords appear to have lived there from that date on. It is not known when it was built. Francis Isdell who first leased the land to the Bomfords was living there in 1709 and it was probable that he had been there since the 1600s; however his house would not be a slated one, it was more likely to be thatched or more probably the ‘castle’ which was there in 1640. No doubt Stephen the elder made improvements, after all he had nine children and extensive lands; it is suggested that it was he who built the two storied slated house around the 1730s. Gallow was pulled down during the 1960s and a new house built on the site, but parts of the yard remain. In 2005 it was a stud farm. Ferrans House, Ferransville, must be comparatively new. 1836 is the first actual mention of the house, when Isaac North was living there. There was no previous house of note on Ferrans. It is not known when Isaac North first took his lease of the place, but probably before he married Belinda Pilkington in 1830. If we knew his birth date (b c1795: 27.5.2) we could hazard a guess as to when he started working; however we do know that he was under 21 in 1807 and so it is likely that he came of age before 1820, so he may have started farming Ferrans about then, and, soon after, built the house. It is thought that young Isaac North did not pay for the house, after all he only had a lease at that time, but that the house was built by Isaac Bomford sometime during the 1820s. This 1820 estimate also matches Burke’s Guide to Country Houses, which says of Ferrans, “a two story five bay late Georgian house with an eaved roof”. It is not suggested that the house of the 1820s was as big as that described in Burke but that it was enlarged later, perhaps during the 1860s (see 27.3.1). There was a boom in country house building from around 1800 until the Famine of 1845 - 1846, and these houses are recognisable because they had features which were rare in the 1700s. Most were two storeyed; the three storey house was out of fashion and rare after about 1810. Most had roofs with over-hanging eaves and external guttering: this was a new idea and the older houses had a parapet with enclosed guttering. Most had porches, the older houses initially had none but many had them added about this time; this was probably a reflection on the improvements in the roads, which enabled people to come visiting in their carriages wearing their best clothes. The Famine hit the smaller gentry even worse than the richer families and so not only ended the boom in building but caused many country houses and estates to be sold; some of them compulsorily by order of the Encumbered Estates Court. Indeed this may well have had something to do with the fate of Cushenstown. 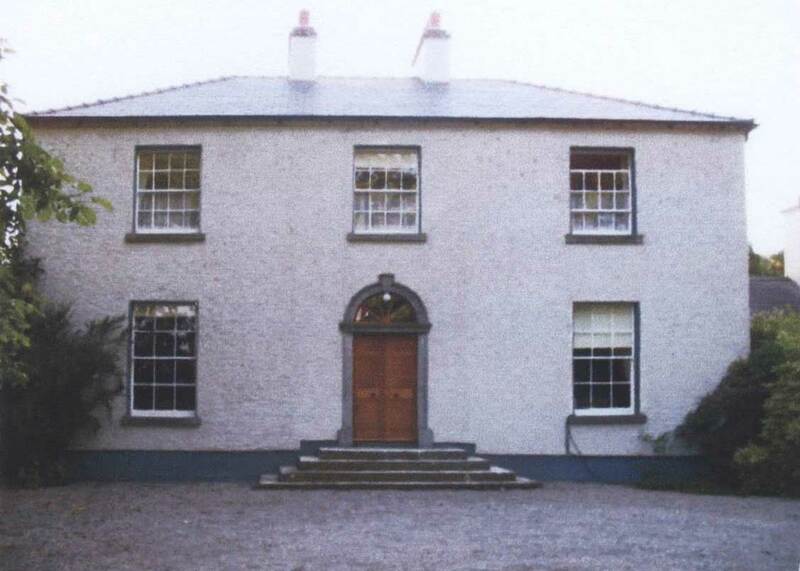 Ferrans House was continuously occupied by the North-Bomfords until Isaac North’s grandson, John George, died in 1965 shortly after which the place was sold. The house was deliberately burnt down by the I.R.A in 1923 (28.6.1) and rebuilt with improvements soon after; it was accidentally burnt down in 1972 and was rebuilt. Ferrans, like its neighbour Gallow, was a stud farm in 2005. Already included are two deeds of 1831 (18.6.2 and 22.2.2), which indicate that Isaac was giving up his work as an attorney when he was 65. 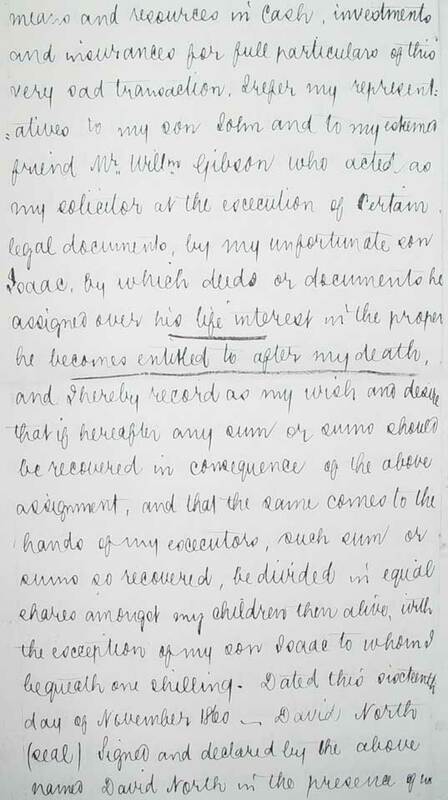 In 1835, when he made his will (below), he was nearly 70. He died in 1837 (23.5) at No 43 Blessington Street and, as requested in his will, was buried in the Churchyard at Gallow alongside his father and mother, David and Sarah (Burtchaell) (8.11), aged 71. Although three of his sisters were alive, Isaac was the last male of his generation and the last great grandson of Colonel Laurence Bomford to die. The following is a shortened version of Isaac's will extracted from the files of the Land Commission Offices. I, Isaac Bomford, of the City of Dublin do make my last will and testament. Whereas I am possessed of interest in the lands of Gallow and Ferrans in Co Meath, and of Tyrrellstown in Co Westmeath, I do leave to my beloved wife, Jane Bomford, an annuity of £280 for her life to be paid from the lands of Gallow, and £60 to be paid from the lands of Ferrans, and £60 to be paid from the lands of Tyrrellstown (making a total annuity of £400). I leave to my sisters, Jane Cooper and Anne North, a £20 annuity each and this is to discharge any claim they may have against the land under the will of my father, the late David Bomford. I leave to my sister Sarah Frances Coates for her natural life £40 per annum from the lands of Ferrans. I bequeath to John Cooper, eldest son of Jane Cooper, £20 a year from Ferrans. I bequeath to Stephen Coates, third son of Sarah Frances Coates, £40 per annum from the land of Ferrans. I leave, subject to the above bequests, Gallow and Ferrans to my nephew John North (eldest son of Anne North) in trust for my nephew Isaac North (third son of Anne North), provided Isaac shall adopt my sir name from my death and that his sons will adopt my sir name. In default of such issue then the property shall be passed to John Coates, second son of Sarah Frances Coates. I bequeath Tyrrellstown to John North and his heirs subject to the above annuities in trust to my nephew David North, second son of Anne North, then to Isaac North, the third son. As for my personal property. I bequeath to Mrs Frances Colbourn, daughter of my sister Jane Cooper, £50; to Mrs Jane Richardson, daughter of Jane Cooper, £100; to the daughter of my sister Anne North, and to the daughter of my sister Sarah Frances Coates, £150 each; to my kinsmen, Sackville Burroughs, William Hamilton Burroughs, and James Lewis Burroughs, sons of the late Archdeacon John Burroughs, £150 each [see 16.7.3, the children of Anne Trevor Bomford and Archdeacon Jno Newburgh Burroughs]; to John Coates, son of Sarah Frances Coates, any arrears of rent at my death by his father John Coates on the land of Brayfield (part of Ferrans); all else to my dearly beloved wife, Jane Bomford, who I appoint as sole executrix, and I direct that my remains shall be decently but privately interred in the Churchyard of Gallow close to the remains of my much respected father and mother. In the terms of the will Isaac North did take the surname Bomford (25.5) when his uncle died in 1837, and became the founder of the North-Bomford family of Ferrans and Gallow, and it is this family which we shall follow. Tyrrellstown was passed to Isaac’s nephew David North and its future will be found in 23.7.2 - it did not end up with Isaac North-Bomford, the third son of Anne North, but passed to David's eldest son, Isaac Bomford North. This will is an instance of how estates could become so easily encumbered with debts through no fault of the person who inherited. Before any other debts were paid Isaac and David North had to find £540 from the land to pay the bequests of their uncle Isaac. Luckily for them Isaac obviously had considered his bequests carefully since the £540 only amounted to about 20%, or perhaps 25%, of the income from the land as calculated in 23.3.1 and the full amount only had to be paid during the life of their aunt Jane, or for another three years; after 1840 the annuities amounted to about £140 until their aunts Jane and Sarah, and their mother Anne North died. However in many other less considered wills, estates were so seriously encumbered with bequests and mortgages that it might in normal circumstances be difficult to make ends meet. Thus if abnormal circumstances were to appear, as the famine of 1845 - 1846, when day to day running costs rose astronomically, the only option left to the person who inherited was to sell; this was a fairly common occurrence throughout the 1800s in Ireland, but particularly so after the famine. The Coates family has been covered in 19.4.3, and there is nothing to add except that the father John Coates of Bridestream House leased Brayfield consisting of about 78 acres which is part of Ferrans; there is no record of this lease but it appears that he was in arrears with his rent which in the terms of the will was lucky for his son John. Similarly the Cooper family has been covered in 16.2.1 and there is nothing to add. Both these families drop out of the picture and there is no further information about them even though there were probably grandchildren. The St George, Dublin, parish records parish records parish records (multiple records on different pages) record Isaac Bomford of Blessington St, aged 70, was buried on 22 July 1837. The Dublin Almanacks record Mrs Bomford [Jane Holdcroft, 19.5] occupying No 43 Blessington Street for the years 1838, 1839 and 1840, but omit her name in 1841. No further Bomford is recorded in this house so it must have been sold on her death. Jane Bomford of Blessington Street, City of Dublin, widow, died 27th May 1840; Probate 11th June 1840 to Henry Radcliff and Edward Kellett of Blessington Street, Esqrs. I leave to the Poor of St George’s Parish £100, to the Poor of Gallo in Co Meath £100. No doubt Jane was buried with her husband in Gallow Churchyard. St George parish records, Dublin, record the burial of Jane Bomford, aged 65, of Blessington St on 25 May 1840. The original record has an annotation, 'fees paid'. Paragraph 25.3.4 contains an account of ‘The Big Wind’ of 6th January 1839. A few days before the Big Wind the Bethesda Chapel in Dorset Street was partially burnt down; it was thought that the fire was out but the Big Wind fanned some still glowing embers and the Chapel was completely destroyed that night. This turned into a major incident as sparks from the burning chapel landed on neighbouring houses, many caught fire and at least one was totally destroyed. At one stage it was feared that the wind would spread the flames and destroy the whole area, as had happened in the Great Fire of London in 1666, so the military were turned out; luckily the wind eased and they were able to contain the fire. It may well be this conflagration which prompted Jane’s donation of £250 to the poor of Bethesda. The reason behind the donation to the poor of St George’s Parish might be because of the structural failure of St George’s Church. St George’s was one of the finest churches in Dublin at that time and had not been completed until 1813; it was given an enormous roof span of 65 feet but the architect, Francis Johnston, had failed to give it sufficient support and it nearly collapsed in 1836; it was only saved by the insertion of iron arches which operation was completed in 1840. This church was more likely to have been Jane’s church as it was just round the corner from Blessington Street at the end of Hardwicke Street. Before continuing with Isaac and Belinda Emily North-Bomford’s family, it is convenient if we complete what is known about his two brothers and sister who carried on with the surname of just ‘North’. North family tree. 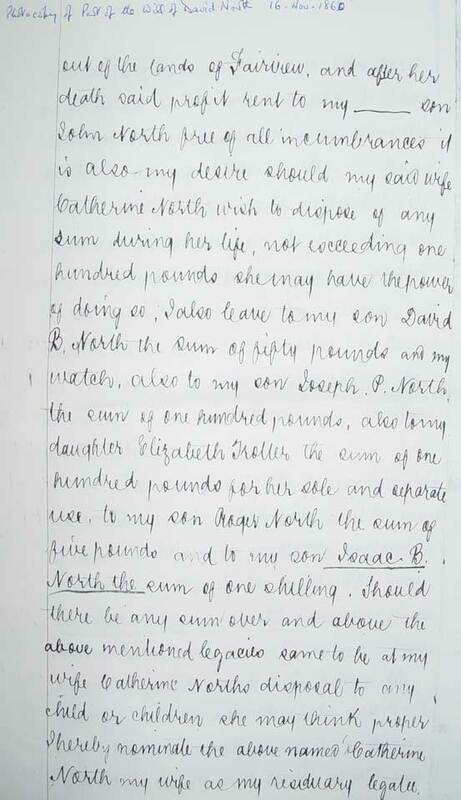 Their mother, Anne Bomford was still alive in 1835 when her brother Isaac wrote his will (23.4.1). There is a badly damaged grave of a John North d 1836 or 1838 (the last 2 digits in the date are not clear on the gravestone) in the cemetery on the edge of Dunboden [Sheila Perino email 14 Mar 2007] and it is thought that is the grave of Anne's husband John North [Sheila Perino email 11 Sep 2007]. Anne is buried in the same grave; the date of her death has not been deciphered [Sheila Perino emails 11 & 13 Sep 2007]. 2. Isaac North-Bomford of Gallow (we shall return to his family later). 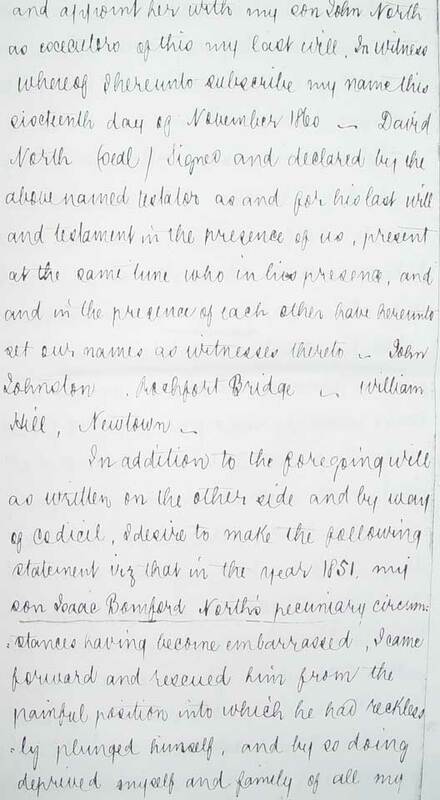 Isaac Bomford’s will of 1835 (23.4.1) states that John was the eldest son, David the second and Isaac the third son (this order is supported by the order given in David Bomford's will at 19.6); the will also records 'a daughter' but she is not named. Thus the order in Burke is wrong and the daughter is missing, though the details as far as they go are correct. The multiplicity of John Norths and John Roger Norths in the records makes it difficult to piece together the North generations. There are two John North marriages recorded in the index to marriage licences (ML) in the late 1820s: John North and Anne Maud in 1827; and John North and Eleanor Barber in 1829; in addition, there is a John North and Charlotte Homan marriage in 1819 (ML). John North and Anne Bomford's eldest son John Roger North is thought to be the husband of Eleanor Barber, as she died in Whitewell, and as stated in Burke. The John North who married Ann Maud in 1827 is not known. Anne Maud was born c1809, died on 1 April 1871 at 124 Rathmines, South Dublin and was recorded on her death certificate as the widow of a builder. One John North who married an Anne was a building contractor who won a contact to rebuild the Newgate Gaol in Dublin (16.3.1). A William North married a Maria Homan in 1806 (16.4.7) - Maria Homan could well be a relative of Charlotte Homan, but no links have yet been established. Initially it was thought that John who married Anne Maud was the son of John who married Eleanor Barber, and grandson of John North and Anne Bomford, making three generations of Johns. They were followed by John North of Donneybrook who married Susanna Clarke in 1869. The problem with having three generations as initially thought was that there were not sufficient years between the generations: John North and Anne Bomford married in 1786; John North and Eleanor Barbour in 1829; John North and Anne Maud in 1827; but one John of Whitewell had a third daughter Sarah Frances North who married in 1823 (see below). One way to make the tree consistent with this last fact would be if Sarah Frances were the third daughter of John North and Anne Bomford. Against that, Anne's brother Isaac Bomford's will of 1835 (23.4.1) refers to 'the daughter' of Anne and apparently did not need to name her; but the other known facts are consistent. Her father David Bomford's 1807 will (19.6) refers in addition to David and Isaac to 'her younger children', but that may have been a pro forma expression to take account of any future eventuality. As at September 2007, the tree was arranged with John North and Anne Bomford having three sons and four daughters. The names of the daughters are those of Anne's mother (Sarah Burtchaell) and sisters (Jane and Mary) and John's mother, Deborah. Since then, deed 846 146 566646 has come to light. It names three unmarried daughters of John in 1829: it confirms Deborah and Jane and adds a fifth daughter, Sophie. a. John, who according to his death certificate was 73 when he died on 25 November 1902, so born c1829. According to the 1901 census, he was 61 in 1901, so born c1840. It seems more likely that he was born in the remainder of the year in which his parents married, rather than 10 years later, so the 1829 date is preferred. 1829 is correct: he was baptised on 8 Sep 1829 (St George parish records, Dublin) and the family bible records that he was born on 21 Aug 1829. On 27 August 1869 John married Susanna Clarke, b 1843, d 1899 [Sheila Perino email 23 June 2007], daughter of Frederick Clarke Esq from Rathgar. John lived in Donneybrook, Dublin and is probably the John of Whitewell who leased part of Whitewell to William North (23.7.3)in 1854. John died two days before William. John had at least one daughter. i. Agusta Susanna Elizabeth North, who on 2 February 1900 married William Macbeth Sterne, son of Agustus Sterne. Both William and his father were bank officials. She was still at the Dublin address in the directory the year after her father died. [Email from Sheila Perino 19 Jun 2007]. 4. Isaac North, the third son, was also a minor in 1807 (19.6). He died in October 1886 'aged 71' (27.5.2) so was born c1795, married Belinda Emily Pilkington in 1830 (23.2), and took the name North-Bomford in 1837 and so inherited (23.4.1) his uncle Isaac Bomford’s estates of Gallow and Ferrans; but more of this later in 24.9.4 and Chapter 27. 6. Jane Hannah North, b c1802, d 16 August 1872 in Tyrrellspass aged 70 [death certificate: Sheila Perino email 23 June 2007]. Jane might be 'the daughter' of Anne North mentioned in Isaac Bomford’s 1835 will who received £150 (23.4.1), perhaps because she was unmarried. Jane left a will, which is extracted in the National Archives, and it is from that document that we get her middle name Hannah. Her executor was her nephew Frederick Augustus Gardiner, St Mary's, Chatham, Kent. 7. Sarah Frances North, 'third daughter of John North of Whitewell, Co Westmeath, Esq' married in June 1823 [reported in the Connaught Journal, Galway, Ireland, Monday, June 16, 1823] Godfrey Wills Berry, b 2 Jan 1799, d 1868 in Medway, England, son of William Knight Berry, and had issue. More information on the Berry Family. The Griffiths Valuation for Clonfad, Co Westmeath, records a Godfrey W Berry MD in Tyrrellspass Crescent. A Roger North and a Sophia North are recorded in the same street, another Roger North in Tyrrellspass, and a Peter North at Clonfad. g. Marianne Frances Berry, b 1840, d 1890, married Frederick Augustus Gardiner b 1833, d 1900, and had issue: Sarah Frances Gardiner b 1864; Freda Marian Gardiner b 1867; and Frederick William Gardiner, b 1896 [sic - as recorded on the Berry Family website, but clearly this date is wrong: could be 1869?]. All three children married and had issue. 8. ?Deborah North. Deed 1839.15.189 (EN email 10 Mar 2008) is a marriage settlement dated 7 Aug 1839 'between Roger North, Cappa, Co Galway & Deborah North of Tyrrellspass, Co Westmeath, daughter of John North, deceased'. John North's mother was Deborah Leland, so this Deborah North may be the daughter of John North and Anne Bomford. This is an abridged version extracted from the Land Commission Offices. Much of the will was duplicated and placed with the Bomford documents. Page 1, page 2, page 3, page4. “My last Will and Testament. I, David North of Fairview, Rochfort Bridge, Co Westmeath, do make my last will and testament. I request that as soon as possible after my decease my executors will dispose of all my stock and other property, except for those articles of furniture my wife, Catherine North, might wish to retain for her own use, and the proceeds be invested and the interest be paid to my wife during her life and also the profit rent arising out of the lands of Fairview, and after her death the said profit rent to my son John North free of all incumbrances. It is my desire that my wife Catherine may dispose of any sum during her life not exceeding £100. By way of a codicil I desire to make the following statement. Dated, signed and witnessed as above. These documents further state that David North died at Fairview, Co Westmeath, on the 22nd March 1863; and probate was granted to John North of Garville Avenue, Rathgar, Dublin, on 7th May 1863 with the sum of under £3,000. His gravestone at Dunboden says he died on 22 March 1863 aged 69 (Sheila Perino). The Land Commission has a number of deeds concerning Tyrrellstown together with a schedule of documents, most of which are missing. It is from these that we can follow to a limited extent the life of David North's eldest son, Isaac Bomford North who in 1851 got into the money difficulties mentioned in his father’s will. The origin of Tyrrellstown is a mystery. It suddenly appears in 1724 as a property of Stephen of Gallow, but it may have been in Stephen’s hands as early as 1700 or, indeed, it may have been Colonel Laurence’s even before then. Deed 1851 24 17 in the Registry of Deeds records a transfer of Tyrrellstown (see below) and mentions that David and Isaac North rendered to John Roger North "the original lease thereof bearing date the seventeenth day of June one thousand seven hundred and twenty four and made by John Sloyte[?] to Stephen Bomford" (CN email 9 Jul 2009). In 1753 it was part of the marriage settlement of Stephen’s son, the Rev John Bomford (8.7.1). On Stephen’s death in 1759 it was passed to Rev John who died in 1776 (16.1). Rev John died intestate and the land was divided between his younger brothers, David Bomford and Isaac Bomford, who may have been twins. Isaac died in 1793 (16.6) and left his half share to David’s son Isaac; so Isaac Bomford possessed the whole 347 acres when his father David died in early 1810 (19.6). It is at this point that the history of Tyrrellstown can be followed in the Land Commission papers. Isaac Bomford’s will of 1835 (23.4.1) is referred to, and in it Tyrrellstown was passed to his nephew, David North of Fairview, Rochfortbridge. Just possibly, Tyrrellstown of these deeds is David North's 'Fairview' (Eva North emails 6 Jul 2009 and following). Deed 1851 Book 24 Ref 27 in the Registry of Deeds in Dublin records a transfer on 21 November 1851of the towns and lands of Tyrrellstown, 214 acres 2 roods and 16 perches [plantation or statute? - the deed does not say; 214 acres plantation is 347 acres statute], Parish Moylesker, Barony of Fertullagh, Co Westmeath from David North and Isaac Bomford North, both of Margaret Place in the city of Dublin, to John Roger North for and during the lives of the said David North and Isaac Bomford North and of the survivor of them and all other the estate term and interest of the said David North and Isaac Bomford North therein, nevertheless upon the trusts in said deed mentioned, witnessed by William Gibson (Eva North email 1 Nov 2007; Cyril North email 9 Jul 2009). We assume John Roger North was David's second son, Isaac's brother, to whom the codicil in David's will (23.7.1) refers the reader for details of Isaac's embarrassed pecuniary circumstances, and putting the land into John Roger's hands as trustee was probably designed to put the land out of reach of Isaac's creditors. The trust comes to an end when the second of David and Isaac dies. 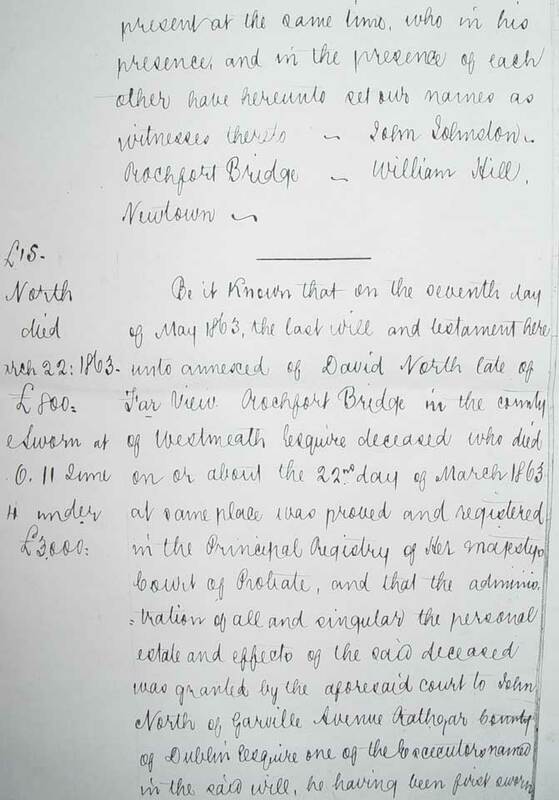 David North’s will of 1860 (23.7.1) is also mentioned in the schedule of documents and the schedule states that the land became the property of David North’s eldest son, Isaac Bomford North, the son who got into money difficulties. There is no mention of Tyrrellstown in the extract of the actual will, perhaps because it was entailed and that the entail was not broken in spite of the deeds of 1819 and 1820 (23.1.2, 23.1.3), which appeared to remove the entail. Or perhaps because it was in the hands of David's brother John Roger North (see preceding paragraph). Or perhaps because the extract is not complete. Registry of Deeds 1893, Book 30, ref 106 (see below), says [Isaac] was entitled to the land under the will of his father David North. Deed 1878 Book 38 No. 32in the Registry of Deeds in Dublin is a deed between Isaac Bomford North, Rutherglen, Victoria, and the Royal Bank of Ireland, Foster Place, Dublin. Isaac transfers all his life estate in townslands of Tyrrellstown, 214 acres, 2 roods, 16 perches, parish of Moylesher, Barony Fartullagh, Westmeath, a sum of £350, and interest at 5% per annum to the Bank (Eva North email 21 Nov 2007). This sounds like a mortgage. A 'life estate' may refer to Isaac's interest in the land being limited by the entail - the land was not his to dispose of, only his for his life, after which the interest passed to the next in line under the entail. According to the schedule of documents, Isaac Bomford North died on 17th May 1886 [in Australia], and Tyrrellstown was passed to his eldest son, also Isaac Bomford North [of Rutherglen and Sydney, Australia]. It is not yet clear how the elder Isaac Bomford North got the land back from the John Roger North who held it in trust under the 1851 deed. Perhaps the trust was terminated once it was clear that Isaac's creditors would not get the land; otherwise it terminated on Isaac's death, and his son Isaac got the life interest. There are three further deeds in the Land Commission record. In this deed Isaac Bomford North junior, in order to defeat the entail created in the will of Isaac Bomford (23.4.1), his great great grand uncle, granted to James Sweeney the land of Tyrrellstown containing 214 plantation acres (347 statute) forever. The Registry of Deeds in Dublin has in 1887 Book 33, Ref 62 a record of a deed signed on 13 June 1887 in which Isaac Bomford North, Victoria, Australia, doth grant to Sweeney, solicitor, Dublin, all those lands at Tyrrellstown 214a 2r 16p Moyleskey, Fartullagh and anything else (Eva North email 8 Dec 2007). As Sweeney was a solicitor, it might be that the lands were transferred to him as a trustee rather than as principal. Isaac Bomford North junior mortgaged the land for £1,550 to Henry Willis and conveyed the land to him. In the Registry of Deeds 1893, Book 30, No 106, Isaac B North, Ultimo, near Sydney, New South Wales, 20 Dec 1892, records a transfer of 208a 2r 26p, being Tyrrellstown, Fartullagh, [to which Isaac was] entitled under the will of his father David North, to Henry and Frances Cherry Willis (Eva North email 8 Dec 2007). Some of this is a little odd. The area has changed from 214a 2 r 16p to 208a 2r 26p, which may or may not be significant. And Isaac Bomford North the son of David North died on 17 May 1886 (23.7.3) so he cannot have been party to this deed and it must have been his eldest son, also Isaac Bomford North, the one who moved to Sydney. And to say that Isaac Bomford North (senior) was entitled to Tyrrellstown 'under his father's will' seems a direct contradiction of the extract of the will and codicil as recorded above (23.7.1), though there is a reference in the codicil to 'his life interest in the property he becomes entitled to after my death,' so perhaps the will did recognise that Isaac remained entitled to the lands. Even if Isaac Bomford North senior's 'life interest' in the land was assigned (as mentioned in the codicil), Isaac Bomford North junior would get the land on the death of Isaac Bomford North senior. Isaac Bomford North junior of Sydney, contractor, recited an indenture dated 15 October 1894 between Henry Willis and Isaac Bomford North, and assigned the land (208 acres) by an indenture made in Sydney to Alfred Henry Collier of Sydney for (it looks like) £700. The tenant was Robert McColl. There is a schedule of the various paddocks comprising the land. The transaction is recorded in the Registry of Deeds at 1897 Book 56, No 211 (Eva North emails 8 & 10 Dec 2007). It is not certain whether this is really the end of Tyrrellstown but nothing further is mentioned or has been discovered. For the record Tyrrellstown has been removed as a Bomford property in 1896, though perhaps it should have been removed in 1835 on the death of Isaac Bomford. 2. 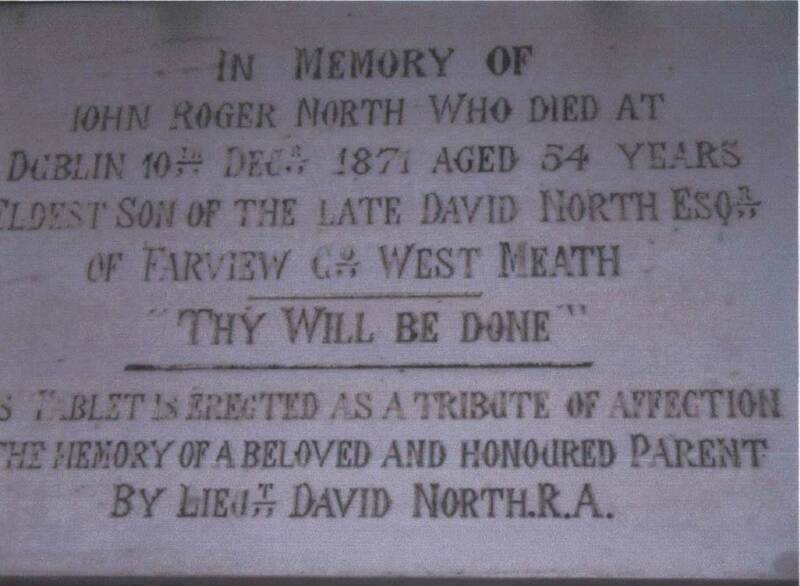 John Roger North, the second son, was born c1818, d 10 Dec 1871, was an executor of his father’s will and inherited his property, including Fairview, the family home. It would appear that the name ‘Fairview’ has been changed in recent maps to ‘Far View’ or 'Farview'; perhaps it was always Far View; it is about half a mile to the west of Rochfortbridge and about 2½ miles north of the Pilkington’s house of Torr or Tore. b) David North Trotter, b 24 May 1856 Forkhill, d 16 March 1912. Never married. Buried Agher, Co Meath. Gentleman farmer, qualified St. And. [presumably St Andrews, Scotland?] [email from Eva North 11 Aug 2007, from Thoms Dublin Directory]. Listed as no. 5 in the Trinity College All Time Greats Cricket Team. c) Kate Maria Trotter, b 11 Jan 1858, d 9 Apr 1871, buried Agher. d) William John Trotter, b 24 Dec 1859, d 7 Nov 1921. William is noted as the son present on both his parents' death certificates. Eva North suggests [email 11 Aug 2007] that William was a major in the army and was probably serving in The Curragh, Co Kildare. At the time of his father's death when they were living in Tipper House, Naas. He was a medical doctor and spent most of his career in the Royal Army Medical Corps and much of that time was in India. In retirement, he seems to have lived mainly at Naas, Co Kildare, in the townland of Tipper. However, he must also have spent part of his time at Galtrim Lodge, near Summerhill, Co Meath, and it was here that he died on 7 Nov 1921 when a coal lorry struck a brick wall and he was hit by the falling masonry. He was married to Flora Jeanette Boyd and they had four children, two of whom survived to adulthood: Daisy Maria Trotter, b 23 Feb 1896, Sitapur, India - she married Lieutenant J Grant Fleming, DSO, MC, of the 2/21st Punjabis on 18 Aug 1919; David William Trotter, b 30 Jan 1900 at Bareilly, India - not sure what happened to him [email from Julia Kable 14 Aug 2007]. e) John Theobald Trotter, b c1861, d 16 Apr 1935. Never married. Church of Ireland clergyman, Precentor of Leighlin Cathedral and 40 years Rector of Cloydah & Bilbo, near Carlow. Buried Cloydah. f) Constance Elizabeth Trotter, b 1864. Married Graves Chamney Swan at Dublin 5 May 1891. 6. Roger North is the youngest in the will. He only got £5 in his father’s will, which seems a very small amount. Perhaps he too blotted his copybook, or perhaps it is a mistake for £50, a more likely figure [though the five in the transcript is a word, not a numeral]. The sequence of David’s children is taken from his will but there is no guarantee that David wrote them down in the correct order, although that was the usual procedure, and there may have been other children not mentioned in the will. Possibly one such is William, who may have been written out of his father's will in 1860, the year William married a Catholic. 7. ?William North, b c1821 (aged 80 in the 1901 census), d 27 November 1902 [email from Sheila Perino 19 June 2007], an occupier (lessee) at Whitewell in 1854 and through to the late 1890s, converted to Catholicism and on 29 November 1860 married a catholic, Elizabeth Keogh, b April 1839, d 22 October 1918, and had issue. Family tradition is that William was the son of a wealthy Protestant man whose brother disinherited him for becoming Catholic and marrying in 1860 [Sheila Perino email 1 Sep 2007]. Elizabeth Keogh lived in Rahnine which is in the same small townland of Castlelost where David's family lived. It would account for how they met. She may have been a servant. The names Isaac, Anne, Catherine, Joseph and Jane are not from her family. They are names in David's family. Elizabeth, William and Mary appear in both the North and Keogh families [Sheila Perino email 1 Sep 2007]. An alternative hypothesis is that William was descended from a North family living in Newport, Co Tipperary, and went to live with David's family (though in the 1901 census, William says he was born in Westmeath: SP email 1 Sep 2007). a) Anne North, b October 1861, d 17 April 1943, m on 27 April 1892 in Brisbane, Australia, William O'Neill and had issue. b) William North, b December 1862, m on 2 December 1896 in Brisbane, Kate Kelvin and had no children. c) Mary North, b 19 May 1864 (? ), became Sister Veronica at Yass, Australia. d) Isaac North, b 1 March 1866, d 10 June 1945, m on 27 September 1899 in Brisbane, Catherine Leahy and had no children. e) Margaret North, b 28 March 1868, d 1 May 1959, m on 10 February 1904 in Brisbane, Patrick McGrath and had issue. g) Joseph North, b 26 February 1872, d 7 September 1935, m 4 October 1908 in New York City, Julia Collins, and had issue. h) Patrick North, b 10 October 1874, d 11 December 1954, m 27 January 1915 at Rochfortbridge, Co Westmeath, Mary Ellen Carty, aged 24, daughter of Laurence Carty & Julia New [Sheila Perino email 6 Sep 2007], and had issue. i) Catherine North, b 13 August 1876, d May 1961, m 8 September 1904 at Rochfortbridge, James Mulligan, moved to Rhode, Co Offaly, and had issue. j) Jane North, b 25 June 1878, d November 1962, became Sister Mary Benigna, Sisters of Notre Dame, Tyngsboro, Massachusetts, USA. k) James North, b July 1881, d 19 May 1883 at Rochfortbridge, Ireland.